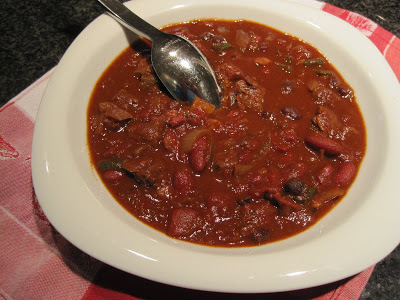 Beer Bacon Chocolate Chili – YUM! Have you noticed how everyone’s been posting fall comfort foods this week? I think it’s because in many parts of the country the weather has suddenly changed practically overnight, from summer to fall. Here in the midwest it’s been between the high 40s – mid 70s all week. The wind’s been blowing and the leaves are starting to turn yellow. I love fall, so today when it was chilly and raining out, I decided to make a pot of chili. Not just any chili but Beer Bacon Chocolate Chili. Over the summer I happened to connect with Renee on Linkedin, and read how she had been on The Today Show for this recipe she created. I viewed the recipe and knew I had to try it just as soon as the hot temperatures broke. Today was that day. I followed Renee’s recipe but made a few slight changes based upon ingredients that I had on hand. Oh my goodness, this chili is out of this world DELICIOUS!!! I typically make a sweet chili since I tend to love sweets. However, this is a robust chili, I guess you’d say. It’s thick, meaty, and packed with flavor. You can spice it up however you like and of course, as with any recipe, make the changes to suit your tastes. Here’s Renee’s version, and in red, is how I changed it. I’ve also added my photos that follow the directions. Try the recipe below, you’ll love it! 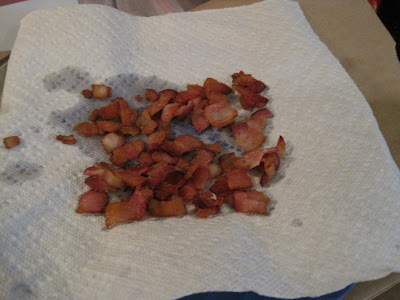 Add meat to the bacon drippings and brown well. 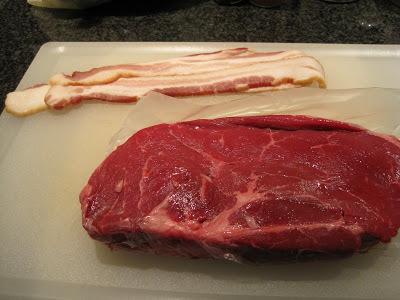 You may need to drain the meat in the middle of browning. 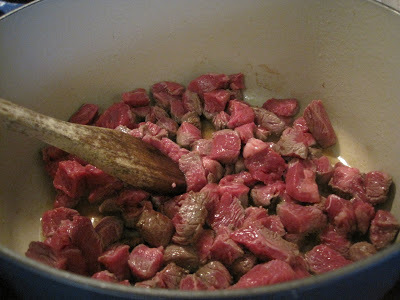 Once the meat is brown, remove it from the pan and set aside. Add the peppers to the pot and cook until they start to brown, approximately 3 minutes. 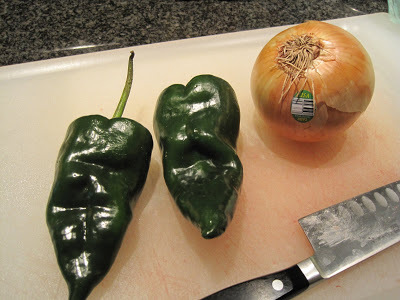 Add onions to the peppers and continue to brown until the onions just start to become translucent. 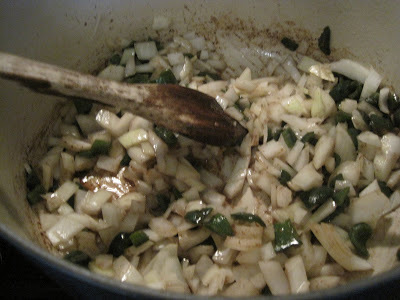 Add the meat and bacon to the onions and peppers and brown for an additional 5 – 8 minutes. Add the diced tomatoes to the mixture and stir well. Over medium-high cook until the mixture just starts to boil. Add the beans to the pot and cook until it just starts to boil again. Add the crushed tomatoes and cook, again, until it just starts to boil. Stir in the chili powder and brown sugar. When the mixture JUST starts to boil again, stir in shaved chocolate I put 3 broken squares, of the Vosges, into the pot. 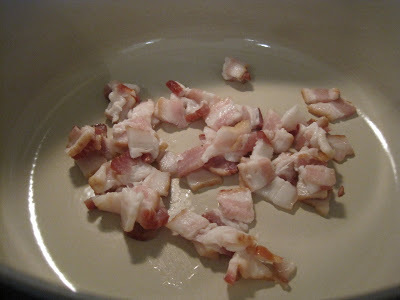 Bring to a slow boil and salt to taste. 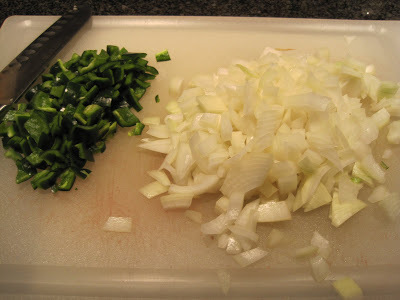 Make sure not to over-salt, as flavors will develop as the chili simmers. 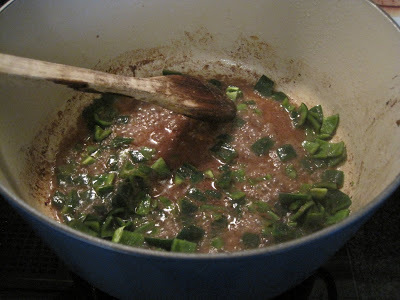 Reduce heat to simmer, cover and let simmer (stirring occasionally) for approximately 2 hours. This was so good, I didn’t add a thing. I could have eaten the entire pot but I refrained so I wouldn’t end up sick. If you love chili you owe it to yourself to try this recipe. It’s amazing! At least I think so. I can see how this is OH, MY delicious! It looks amazing! I was never a chili fan, until I started making my own! GOOD chili is a thing of beauty! This is really good chili. I kept going back for spoonfuls. It would be easy to cut the calories. You could use tenderloin, which is lower in fat but higher priced. 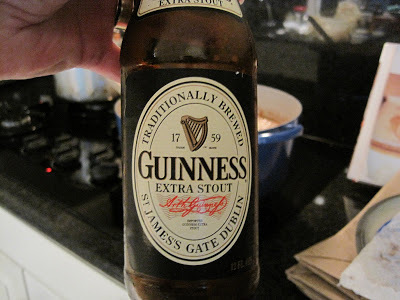 You could use a light beer and I suppose leave out the chocolate or reduce it the flavor would be different but still good. I loved that chocolate bar I used. It had chipotle peppers and chilies in it with a hint of cinnamon. It definitely added to the richness of the broth. Thank you for adding yourself to Google Friend Connect. You put me over the 100th person. Hurray! Hi Vicki! I’m here for the first time and thanks Ann for sending you to my blog first. 🙂 Oh I believe you! This chili looks so delicious. I’m going to take your words and bookmarked already. It looks really delicious! Thank you so much for trying my recipe! I am so glad that you let me know so I can now follow your blog, it’s beautiful! You are about the 5th person who has let me know they tried this recipe and lived it, which makes me so, so happy! As a blogger I often wonder if my recipes come out as good for others as they do for me, so thanks for the validation, it feels great! I just added you to my google reader, so I will definitely stay in touch! You’re right Renee it was their loss, it’s delicious. I’m like you, it’s so nice to hear when people make comments about the recipes we post after they’ve attempted them as well. It’s a great feeling to know you were able to share something that others like as well. I’m going to try and control myself from having the chili for breakfast this morning. I literally thought about it all night it was that good. Thanks again for sharing it. Have a great weekend. Hi Nami so glad you stopped by. I hope when you try the recipe you enjoy it as much as we have. This is a beautiful and delicious dish with all the quality ingredients you have put into it. I love chilli and this is just right up my alley! Thanks for sharing! 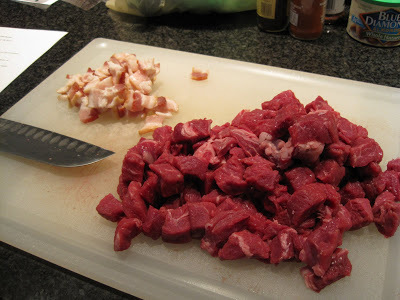 @chopinandmysaucepan – yes the ingredients are high quality and it shows in the flavor. If you don’t want to purchase the Vosges chocolate feel free to use what you like or have on hand, I know you’ll love it. My husband and I just had some more with lunch. I love the piece you wrote about 9/11 and the world on your blog, it was beautiful! @Desi – Thank you for following me Desi. I’ll definitely check out your blog. Please try the chili, it’s delicious and perfect for fall. 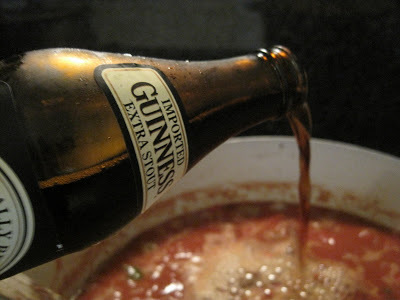 Wow, this chili sounds so good with beer bacon and chocolate, awesome! i am making this as we speak. 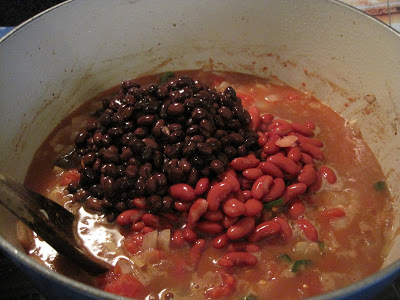 but alas, because i am a neophyte cook, i didn’t drain the beans! it is now simmering and i have the lid cocked a little so it won’t be too thin. crazy thing is, it’s actually pretty thick and still tastes great! also THANKS FOR THE STEP BY STEP PHOTOS! i know what all the ingredients should look like before they go in the pot. essential for me when i don’t know the difference between chop and julienne! thanks!! Not to worry hollyjolly about not draining the beans. I do it mostly to reduce the sodium content. The chili will still taste perfect. Let me know what you think. Thank you for your comment.